Zoho Sprints is a clutter-free agile tool that lets you stay ready for change and deliver great products on time. 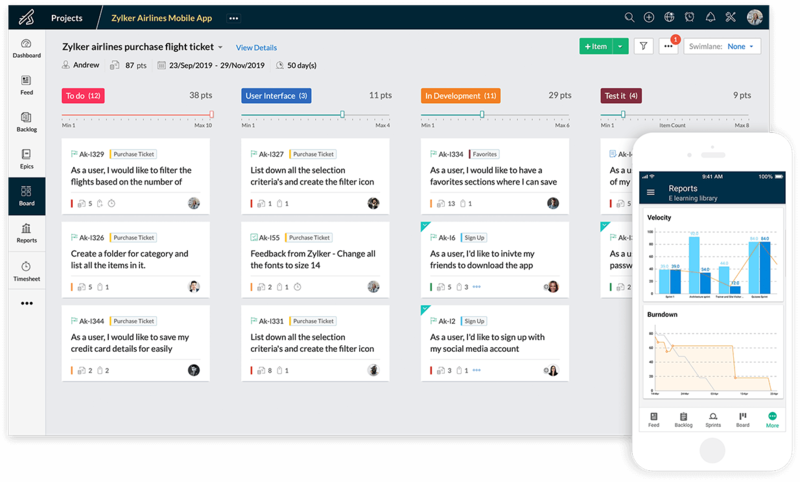 Create user stories, add estimation points, stay on track with personalized scrum boards, and schedule your review and retrospective meetings from one place. Get early feedback and ship the products your customers really want. Move what's on top of your backlog to your next sprint to build what matters first. Track progress on the board. The Scrum Board lets you track your tasks through the 'To do,' 'In progress,' and 'Done' columns. Add your own custom columns to match your team’s unique needs. Time is money when you can account for it. Use Timesheets to to give your clients a picture of the time involved or to estimate the next sprint better. Get a quick pulse of the project. Dashboard gives you an overview of where things stand. See who the top users are, a summary of the sprint activities, backlog metrics, planned vs actual graph and more. Velocity charts, burn-down reports and Cumulative Flow Diagrams help you turn raw data into actionable insights. Learn from each sprint and get more out of the next! A feed for every project helps to keep the discussions alive. Schedule sprint planning meetings, reviews, and retrospectives and the app reminds everyone to be there! "Great software that helps dev teams. 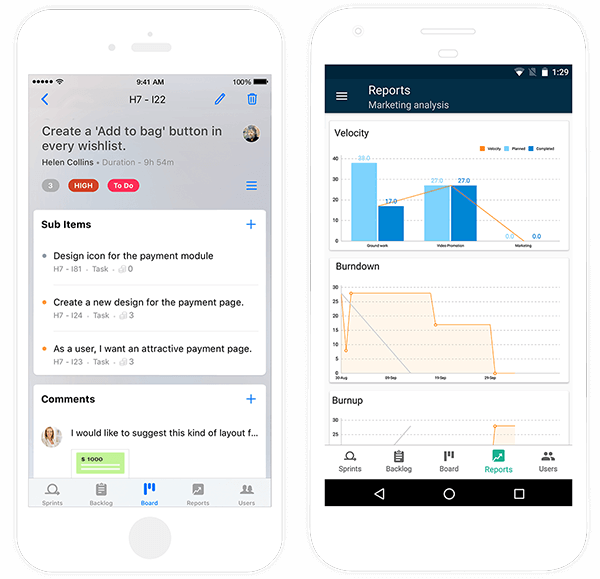 It has everything in agile methodology"
Sprints for iOS and Android helps you manage and track your agile projects. Know where each sprint stands in the Scrum Board, get insights from agile reports, and collaborate on the go.